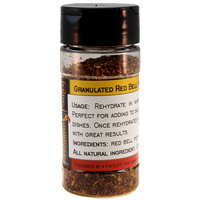 Granulated Red Bell Peppers are ripe, sweet peppers that have been dehydrated and chopped into very small pieces. Use in Italian, Asian and Mexican dishes. Works perfectly in meatballs, cheese dips, chili, and on pizza. 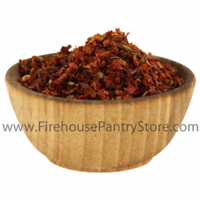 Sprinkle onto prepared seafood and pastas or add to salsas and barbecue sauces. Stores and travels well - great for emergency food supplies, camping, boating, and RVing. Ingredients: red bell pepper. Package in a facility that also processes milk, soy, wheat, eggs, nuts, and peanuts.